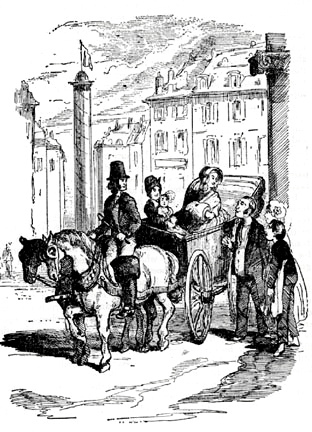 She went off in one of his carriages; her French bonne with her; the child by her side; the admirable landlord and landlady smiling farewell to her at the gate” (Chapter 36). And then Mrs. Crawley was dying and Becky was concerned about their future. So with debts left unpaid and their son in tow, the couple absconded to London where the old Miss Crawley had died leaving most everything to Mr. Pitt and his wife, Jane. One day Rawdon meets Mr. Sedley and little Georgie while out for a walk with Rawdon. The boys are taken by each other, but this is sure to raise heck somewhere. One sunday morining, as Rawdon Crawley, his little son and the pony, were taking their accustomed walk in the Park, they pass by an old acquaintance of the Colonel’s, Corporal Clink, of the regiment, who was in conversation with a friend, an old gentleman, who held a boy in his arm about the age of little Rawdon. This other youngster had seized hold of the Waterloo medal which the Corporal wore, and was examining it with delight” (Chapter 37). And Joseph Sedley has returned to his post in India from where he sometimes sendsmoney to his parents. Sir Pitt dies and Mr. Pitt gets just about everything. Becky notices this and beguiles him – and she is one of the family now. Lady Southdown about has a fit, but Jane obeys her hubby and invites Becky and Rawdon to things. Becky has plans for bigger things. There is much inter-servant gossip about Amelia marrying the parson and Dobbin marrying the O’Dowd daughter. Neither is true. Amelia and family are very poor, her mother blames her for it, Amelia doesn’t want anyone but herself touching Georgie. We’re really following only two plot threads at this point – there’s Becky with Rawdon and how she connives to get status in society. Then there’s Amelia who tries to get money to be able to raise Georgie Jr.
And there’s a very strange chapter (#47, “Gaunt House”) dealing with the Styne/Gaunt/Barecres bunch with whom Becky becomes ensnared via her sister-in-law, Lady Sheepshanks Pitt, in order to advance her position in court. Lady Bareacres is the woman who tried to buy Becky’s horses to get out of Belgium. She is now destitute but a part of society, living off the good will of Styne. Also, her daughter Blanche threw herself at Georgie there. Message – with very few exceptions, people are all the same, greedy, greedy, greedy. The exceptions in this book are probably Amelia, in love with George, and Dobbin who is in love with Amelia. What all is Becky doing to get the money and good will of Styne? Are they in an adulterous relationship? Mrs. Styne is totally browbeaten. Amelia finds out that her father, Mr. Sedley, has squandered the money Joseph sent them and she realizes she has to give Georgie to the Osbornes. The old man lives alone with his much misused spinster daughter now – they have money. And Becky hords the money she gets – so one night Rawdon gets out of the debtors hostile ( a set-up?) early and finds her alone with Styne. It’s obviously a flirtatious situation but not necessarily en flagrante. Rawdon blows up, searches his wife’s belongings, finds her money stash and leaves. Styne leaves. Now Becky is alone – her servants will not assist her and won’t leave until they get paid (except the French maid who steals some jewelry and makes her get-away). She spends a couple days thinking then takes everything and goes to see what she can do on her own. Meanwhile Pitt realizes he has some kind of obligation to his brother and they come to a small agreement. But Becky approaches too and Pitt is caught between loyalties. Rawland gets a position with the government on an island (via Sedley who does not want to be sued). He pays Becky a settlement and Rawland is at school during the week and with Pitt and Lady Jane on the weekends. Rawland provides, Becky doesn’t even visit. Georgie meanwhile, is being spoiled rotten with his Grandfather Osborne. Gets whatever he wants and acts like a lord. Grandpa Osborne has big plans for this child. Old Mrs. Sedley dies and Amelia is now alone with her father who is bitter and broke. Dobbin returns from India with Jos Sedley – he and Amelia straighten things out and Dobbin confesses his love for her but she just cries. Jos returns – he’s a mess but he cleans up rather well. Amelia’s circumstances improve and Old Sedley dies leaving virtually nothing. And then Osborne dies leaving Georgie half his estate but leaving Georgie to Amelia with an annuity. So now Amelia’s got money but she’s bored. It’s time for a trip so they all (Amelia, Georgie, Jos and Dobbin) go to visit the kingdoms of Germany. They stay in one town for quite a while and this is where the narrator actually meets them. They get involved with society and it turns out there’s a gaming room open during a festival. Jos goes, of course, brings Georgie, runs into Becky who is definitely down on her luck. Becky’s back-story is told. The next day Becky is warned to get out of town but she ignores that. Jos goes to visit her and gets her side of the story which he believes. He tells Amelia and she believes it so invites her to live with them. Dobbin is horrified and puts his foot down – tells her about George’s infatuation with Becky and says Amelia is not worth his love. (This is good to hear – he’s standing up for himself.) 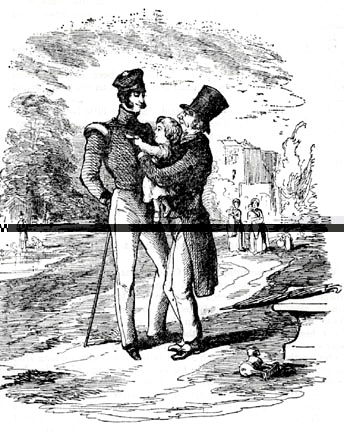 But Ameia will never forgive Dobbin now – not after besmirching the name of George. The story twists a couple more times but in the end Amelia and Dobbin get together, marry, have a baby girl. Becky and Jos get together, kind of, but Jos dies. Rawdon Jr. gets his money and sends some to Becky but doesn’t speak to her.